365 days in the Antarctic, of which 257 days cut off from the outside world. 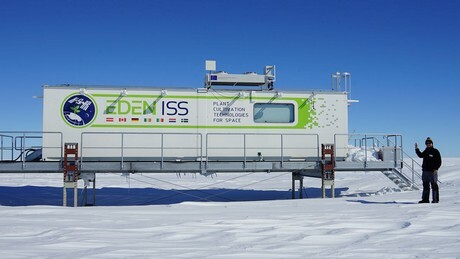 Antarctic grower Paul Zabel from the German Aerospace Center (DLR) has tested vegetable cultivation, suitable for Moon and Mars environments in the EDEN-ISS greenhouse. There, he harvested peppers, tomatoes, cucumbers and various lettuces and herbs, grown with the use of artificial light. Now Paul Zabel has returned to Germany and, at a press conference at the DLR Bremen site, he spoke for the first time since his arrival of his efforts and deprivations of recent months, as well as the joys of plant breeding in extreme situations and his life on the seventh continent. "The Antarctic is a fascinating place and I am very happy that I could be one of the few people who had the opportunity to spend the winter there, having experienced many unique impressions and challenges over the past 12 months. Now it is great to be back home, seeing family, friends and colleagues again," said Zabel. "Antarctic grower" Paul Zabel returned after a stopover at the Antarctic Novo Airbase and a short stay in Cape Town shortly before celebrating Christmas in his home in the Brandenburg Spreewald. "Having spent Christmas 2017 in the Antarctic, it was very special to spend Christmas Eve and New Year's Eve at home." Zabel left for the Antarctic on 16 December 2017, with three other members of the EDEN-ISS team. After a two-month build-up phase, he remained there from February 18, 2018 on German Antarctic station Neumayer III with nine other overwinterers of the AWI. Day by day, Zabel set off on the commute to the EDEN-ISS greenhouse, about 400 meters from the station. Only during the strongest storms, of which Zabel experienced many during the Antarctic winter, the greenhouse was monitored and controlled automatically by people in the Bremen control center. "From Bremen, we were in daily contact with Paul," reports EDEN-ISS's Daniel Schubert from the DLR Space Systems Institute. "He has done a great job over the past months. Although it has taken up quite a lot of his time, the EDEN-ISS project and he himself will be thanked by future astronauts." Other members of the AWI hibernation team also helped Paul Zabel with his work. They aided him with the sowing of the plants and supported him with the numerous experiments. "After more than a year in the Antarctic, we can look back on successful overwintering." The work in the greenhouse and the fresh vegetables have enriched our time at the Neumayer Station III," says station manager Bernhard Gropp. A detailed evaluation of the studies on plant breeding in Antarctica is currently in full swing. The extensive results, including technical, botanical, microbiological and psychological analysis, are expected in May 2019. It is already clear that Paul Zabel has repeatedly been able to harvest a rich harvest, again supported by the other AWI overwinterers. For example, on Neumayer III over the past year, the crew wwere able to eat 67 kilograms of cucumbers, 46 kilograms of tomatoes, 19 kilograms of kohlrabi, 8 kilograms of radishes, 15 kilograms of herbs and 117 kilograms of lettuce. The station continues to be open to researchers from all over the world. In the next two years, DLR, AWI and other research partners will further develop the production processes in the EDEN-ISS greenhouse, with the goal to offer future stations on the Moon and Mars an optimized greenhouse concept. The continuation of the project is open to researchers from all over the world. "Soon we will hand over the greenhouse to the new overwinterers who will continue the EDEN-ISS project in the Antarctic and look after the crop," says dr. Daniel Schubert. "We will monitor and control the greenhouse from Bremen." Schubert and his team will again travel to the Antarctic in mid-January 2019 to maintain the EDEN-ISS greenhouse and update it technically for the continuation. World food production is one of the key societal challenges of the 21st century. An increasing world population and simultaneous upheavals caused by climate change call for new ways of cultivating crops, even in climatically unfavorable regions. For deserts and areas with low temperatures, as well as space missions to the Moon and Mars, a greenhouse, closed of from the weather, the sun and the seasons, will allow independent harvests, less water consumption and the abandonment of pesticides and insecticides. With the project EDEN-ISS, such a greenhouse of the future can be tested under Antarctic extreme conditions.